Can you give me an advice what to do with probably overheated SMD soldering pads on the board? The photo is of a computer bus card, where there are 4 SMD 0603 positions labeled R1 - R4. They are used for configuring the card frequency from 20 MHz to 40 MHz. These positions should be bridged by 0 ohm resistors. I wanted to reconnect the R2 and R4 positions. I used a soldering station with iron and controlled temperature and electrical 1mm thin solder. I set the temperature to 350 degrees Celsius. I didn't have SMD resistors, so I used just thin wire as I have seen in a web page. However it looks like I overheated the pads - they are a black color and I can't wet them any more with solder. I know I should have better solder with hot air soldering unit and solder paste. I found the same problem described in this forum thread http://eab.abime.net/showthread.php?t=76132 The guy there wanted to increase frequency from 33 MHZ to 40 MHZ on the card but he destroyed the pad like me. Then he found the right pins for R1 pads on ICS511 chip and reconnected the pins 6 and 7. I say ok, 33MHz should be enough. Now can you give me an advice how to solder two pins together ? Is it enough to use only small amount of solder or should i solder thin wire to the pins ? What about using the electrical conductive wire glue ? Or electrical conductive pen is enough ? It appears from the picture that the pads have been completely destroyed and come off the board. The dark color that you see is the underlying raw circuit board material. As described by Michael Karas in his answer, you have overheated the pads, and it seems that some pads and some tracks have come off and are now missing e.g. the track from pin 4 of the ICS511 PLL Clock Multiplier IC to positions R3 and R4 appears to be missing. Therefore you now need to reverse-engineer that part of the circuit, looking for where the missing tracks should be, to decide where you can connect equivalent thin wire (e.g. 30 AWG wire wrap wire or even thinner "magnet wire") to replace those missing tracks and also to simulate the connections of the 0 Ohm resistors which you wanted. You might only need to connect a few links across ICS511 pins, but you need to work that out looking at the PCB tracks e.g. from your photo, it isn't obvious where the lower R2 pad should be connected, as it seems to go under the ICS511. 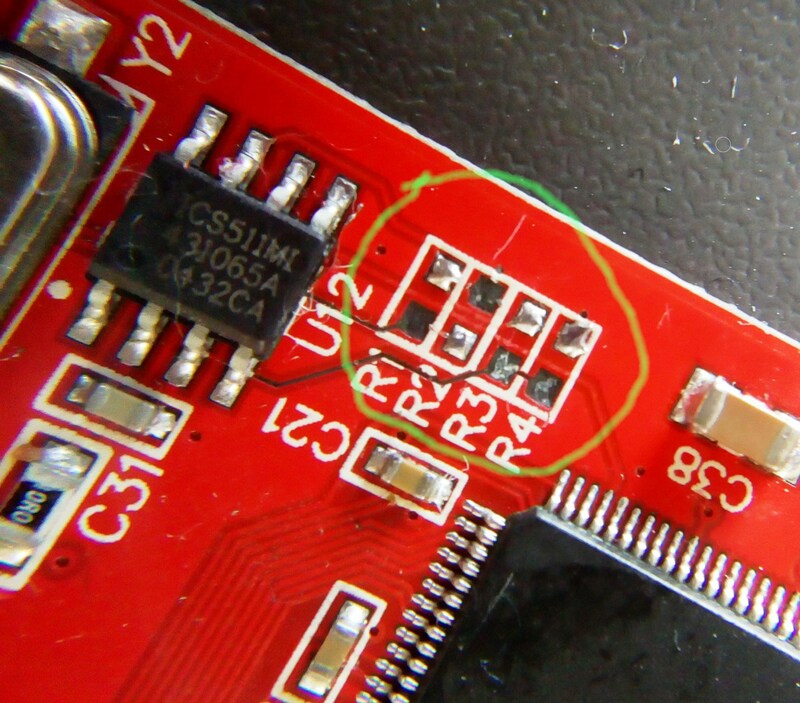 That IC has only 2 inputs, so with some care and magnification, you should be able to reverse engineer that part of the design, to then decide on your repair strategy. However, without better soldering equipment (and perhaps more experience / help etc.) there is a risk that you could make things worse, if you carry on trying to repair that board. They do sell surface mount pad/trace repair kits that you could use which I've used quite successfully. You would have to carefully cut the remnants of what is existing there and then follow the instructions to activate the adhesive on the new pads after laying down smoothly (usually with the use of a flat round iron), then carefully solder the existing traces and new pads together. If you have unused pads elsewhere that don't serve a purpose, you might be able to purposely lift those with a hot air nozzle and then re-lay them in that area, but I'd recommend the pad repair kid first before anything. Again, like the others have said - you could end up making things worse unless you practice a bunch on some sample boards. Soldering such pads with an iron is perfectly fine, the root cause of your problem is that you've set the temperature too high. Lead-based solder which should be used for such kind of rework melts between 180 and 190 °C (360 and 370 °F), and even lead-free solder melts above 220 °C. 350 °C is only useful when soldering large parts or pads connected to ground planes without thermal relief. Another factor contributing to damage is the soldering time. Rather than heating the pads and then trying to put a resistor or a piece of wire in position, you should put everything in place and then heat up to melt the solder. Finally, avoid soldering long wires (or big parts) to small pads. The mechanical stress from a long wire may be enough to tear a pad off the board, even if you didn't overheat it. What are those black spots in these lead-free solder joints? How to check if the pin headers are soldered well?